Images 2, 3 & 4 of ‘the fear series’ are part of a series of video projections focusing on fear, on the camera, and on that which is not clearly articulated. These three, clarity, inheritance and journey are circular, sometimes impressionistic images, projected onto hundreds of buttons stating ‘i am full of fear’. The first, offering, was exhibited as part of the DIG/DUG exhibition at the Koffler Gallery in 2003. The buttons function as both screen and reflection, creating many points of light. Because the text is so subtle, they speak to the difficulty of stating our fears, and address the larger context of fear, be it personal or political. The buttons are also available for sale, as an act of commitment; they function on their own, as wearable art. A reader must enter the wearer’s personal space to be able to read the button. In the wake of 9-11 and subsequent acts of war, in the wake of Canadian and American laws that threaten suspensions of civil liberties, and in the wake of the continued occupation of Iraqi and Palestinian lives, the threats of privatization, and many other sites of colonization, how fear works in our lives and in forming our national and international policies is significant. Fear enters our bodies, our actions, our daily interactions. It occurs at many different levels. The personal declaration of owning fear is a powerful context, however we may not want to state it too loudly. Journey is a close up image of a female face (mine) slightly out of focus, flushed, and suggesting pain or pleasure. The eyes shut every once in a while, an internal state/space is evoked (invoked? ), as is the relationship to the viewer/camera. 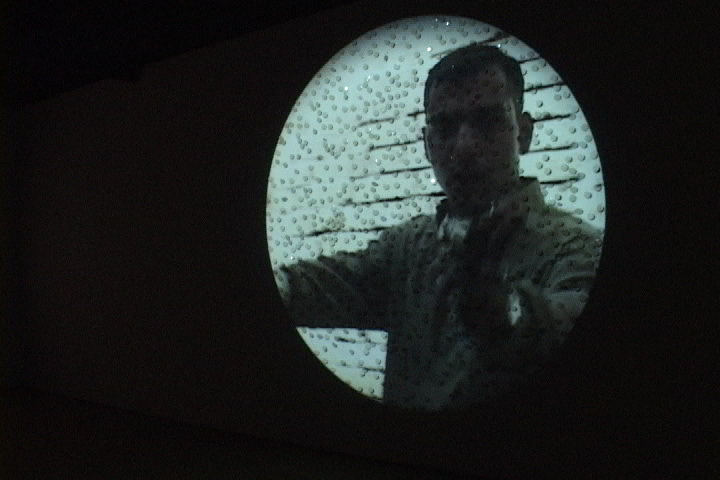 Clarity is a slowed down image of a man pulling a gun on me in the market place of Suk Shorgia, in Baghdad. I had traveled to my mother’s birthplace in the summer of 2003. We went with a peace delegation and after they left, we spent some time searching for my mother's childhood home. The image points to the lawlessness of Baghdad after the American invasion; it is the camera that the assailant is after. It may be that the camera is also an assailant. The projection surface not only involves the‘i am full of fear’ buttons, but also includes a button slogan, taken from a banner in a pro-democracy rally in Baghdad’s Paradise Square, stating ‘we ask for free mass media’. The relationships of fear to invasion, of assault to media access and its transparency, of power relations, as well as gender, are all rolled up in this image and encounter. Inheritance involves three Israeli soldiers at the Damascus gate in Jerusalem. The image is shot in slow shutter speed, a wide shot that includes not only the soldiers but the blurred figures of Palestinians passing by. The soldiers are clearly aware of my presence, one waves, acknowledging the camera. Their fear cannot be named and as such they are cocky. The soldiers converse among themselves, at times more centred on each other, while Palestinians pass through the busy gateway. The image does not reveal the real purposes of such surveillance, and like many images of occupation, appears benign. But it is not. Public discourses of Israel’s occupation of Palestinian land and lives disregard the systemic forces that instigate, perpetuate and necessitate such military presence. The buttons for this projection along with ‘I am full of fear’ also state ‘Jews against the Occupation’, contrary and resistant, but muted voices. These projections, as such, are silent and do not involve any audio component.